Thanks for all the lovely comments on my UFO post. It seems like most settle on three projects at a time. That sounds sane. I am not going for sane, though. I´m going for chaos! 😉 No, seriously, eleven is a little excessive, but I did actually finish one of them yesterday, as well as get some work done on the Aidez. But. I started a new project as well… So I´m back where I started! Oh, well. What can I say, all this lovely yarn is screaming at me “knit me, knit me! ” So what can I do but obey? Enough of that, I promised you some pictures of actual finished garments, and here is one of them. I´m throwing in a pattern review too, for good measures. This project definitely fits into my Fun! sewing too. What´s not to love about a fun print on a pencil skirt? Two different stylings. One office-ish, the other one for running errands. I don´t work at an office. But if I did, I´d walk around like this ALL the time. 🙂 The picture to the upper right tries to show you the fun curved darts. Can you see them? Did it look like the photo/drawing on the pattern envelope once you were done sewing with it? Yup. Were the instructions easy to follow? This is not an overly complicated pattern, so the instructions were not used much, but they made sense when I looked at them! What did you particularly like or dislike about the pattern? I really love the little curved front dart. It´s details like that I love Burda for. So simple, yet very cool. Fabric Used: I used a cotton sateen from Offset Warehouse, a beautiful organic cotton called Brick Layer. I ordered a yard of this fabric on inspiration from Roobeedoo who mentioned them in one of her blog posts. Thanks, Roo! You should all go check out Offset Warehouse, they specialize in eco- and fair trade fabric, clothing and haberdashery. What´s not to love? Pattern alterations or any design changes you made: None. Oh, that´s not true. I probably lengthened it say 8 cm or so. Would you sew it again? Would you recommend it to others? I might use this pattern again, maybe in a solid color? 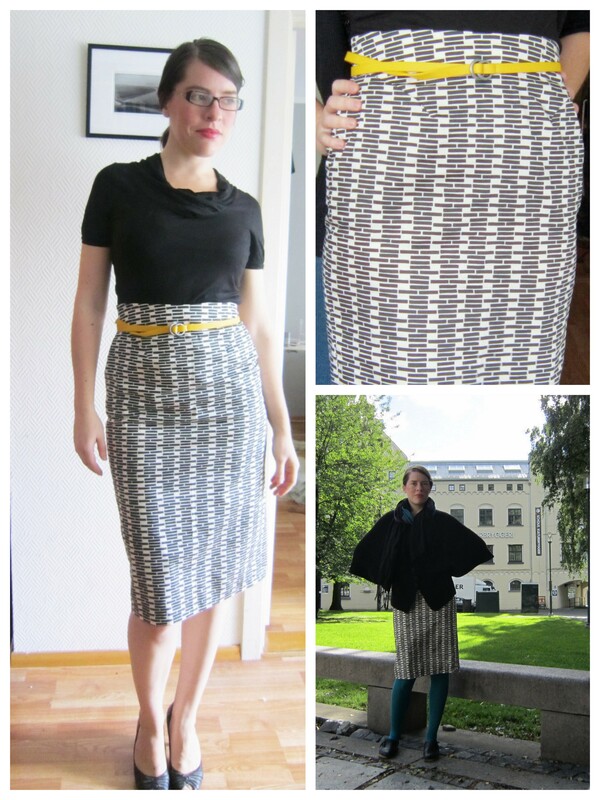 Conclusion: A classic high-waisted pencil skirt, easy to make, fun to wear! This is a great skirt and I love how you have styled it with the teal tights. Fabulous fabric choice! Needless to say, I love this skirt and you look fabulous! It looks great on you! I love it paired with that snazzy yellow belt. And your cape? Fabulous!! I love the skirt and the print. Did you use a special type of interfacing to avoid the waistline rolling over? I read a review on Burdastyle from Frabjous Couture that said she use boning. What a great skirt! It fits really well and I really like the fabric and curved darts! Love it! So versatile and flattering.